These interactive sessions are geared towards educating small groups of students, staff or faculty about sustainability at Western. Topics include energy and water conservation, waste management and ways to get involved on campus. 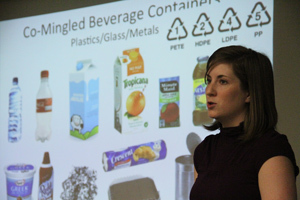 Thirty minutes to two hours in length, these presentations kick-off in a lecture-style format, where several of Western’s sustainability initiatives are highlighted. Then, audience members are encouraged to compete in various challenges in order to show off what they have learned about sustainability. The sustainability lunch and learns are a great way to bring groups of individuals together and teach them valuable information in fun and interesting ways! 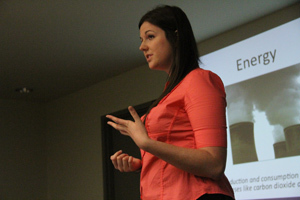 These lecture-style presentations are a great way to educate students, staff or faculty about sustainability at Western. Twenty-minutes to one hour in length, these presentations highlight several of the sustainability initiatives being pursued at Western, including energy and water conservation measures, along with waste management practices. Additional topics can include Western’s awards and recognition, ways to get involved on campus, LEED, and the newly launched PACES document. If you are interested in having the sustainability team come and present to your team, send us an email to sustainability@uwo.ca today!